We offer both Solidor and Veka Composite doors. Both are very good and very secure. The Bahama Solidor Collection is an outstanding range of industry leading, solid laminate timber core composite doors that combine classical, modern or futuristic styling with a full range of Secured by Design locking, providing a stunning, high quality and secure entrance to any home. With a thickness of 48mm, they are nearly 10% thicker than most alternatives, each unique solid timber core is completely encapsulated within a highly durable plastic edge banding and two thermo plastic door skins, so you will never have to worry about painting or varnishing your Bahama Solidor. These doors are exclusively available in the widest range of styles and frame colour options, (17 colours available) with the option of a mobility threshold, making it the perfect solution for easy wheel or push chair access. A comprehensive range of matching combination frames are available with either glass, matching composite side panel or quarter panels, that will complement the look of any property. 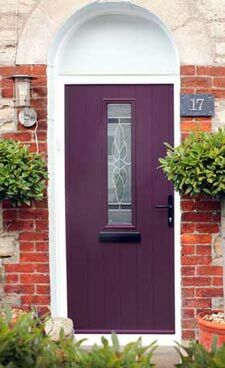 Bahama's Solidor composite doors are manufactured to the highest standards. We hold BSI Kite mark accreditation, BSI ISO 9001 for quality management, BSI EN1279, Pas 23-24 for security and weatherability, CE Marking and a Secured by Design licence. Rest assured that when you choose a Solidor you are enhancing your property with style. All of our fantastic designs are available in any of our 17 colours inside and/or outside of the door, including industry firsts, Mocha, Rich Aubergine, Chartwell Green, Duck Egg Blue, French Grey and Irish Oak. also available with Schwarzbraun, Grey, Cream, Rosewood & Irish Oak, Chartwell Green, Golden Oak, Foiled White and white matched frame. We offer the largest range of colours from stock in the UK. Choose from 18 different frame colour combinations. With Bahama's Solidor, you can mix and match for example: Chartwell Green on White outer frame with Duck Egg Blue on French Grey doors. We understand, that knowing your home and family are protected, is a major factor when choosing your new doors. You can rest assured that with our door construction, coupled with our unique, reinforced door frame and Secured by Design locking systems, your property will be as safe as can be when you choose Solidor. The largest Deadbolt in the UK - Our exclusive Avantis Secured By Design lock gives you the industry's largest 25.4mm dead bolt for added security. It also has built in compression and dampeners to give the smoothest operation on the market. The highest Standard of Cylinder - You will be glad to know that by upgrading to our high security cylinder, you will be protected by the benefits of - anti pick, anti- drill, anti bump and anti snap technology. 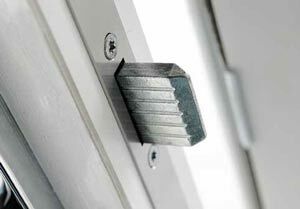 Avantis Multi-point Locking - As standard we fit our exclusive Avantis Secured by design locking systems. With larger hooks for added strength. Avantis Security Cylinder Guard - This is the worlds only "twin" fix cylinder guard. Patented Secured by Design Cylinder technology. Anti pick, anti bump, anti snap and guarded. Key operated Multi - If you'd like no handle on your door, why not upgrade to our key operated multi point lock? Supreme security accreditations - Solidor has obtained the highest standards of security and quality. Heritage automatic slam shut lock - The aesthetics of a traditional rim latch, but incorporating the latest high security multipoint lock, which activates and locks the door automatically once the door is shut. Comes with a thumb turn cylinder as standard. ProSecure High Security Door Handle - The ProSecure door handle, manufactured from a strong zinc alloy, has a wealth of features to provide enhanced security and visible protection. Secured by Design approved, the Police Preferred Specification logo is engraved onto the handle to act as a visual deterrent. Control at your fingertips - Access and protect your property without a key! Whether you use the remote control like your car, or enter your own -12 digit code into the built-in key pad, Yale keyfree couldn't be easier to use - and because it's brought to you by Yale, you know it's technology you can trust. Keyless Digital Lock - NO Keys, NO Hassle, NO fuss all you have to do is remember your own unique pin number. The Yale Keyless Digital lock is secured by a mechanical nightlatch located on the inside of the door. • Thermally efficient Solid Timber Core. • Robust through colour thermo plastic skins. • Realistic wood grain effect or smooth finish. 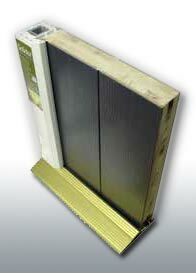 • Optional integral mobility access aluminium threshold. • Only a small section of the door is actually solid. • Thermally great, but foam filled so not solid, nor secure. • Gel coated GRP may be strong but it scratches very easily. 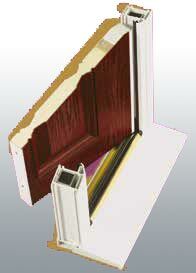 • Most other doors have frames containing lead stabilisers. • The frames are only 3 chambers thick and use valuable steel or aluminium reinforcements. Each door is manufactured using 100% fully recycled door frame reinforcing. As well as superior thermal performance werbar is also super environmentally friendly and out performs steel and aluminium when it comes to screw retention. All of our doors have a guaranteed UV stable colour fastness. All of our Foiled products match, so that the door and the frame match together. A premium glazing system, where fashion and function were viewed as being equally important. No screw hole plugs - Clean design on both outer and cover frames with classic crown moulding and a hand-crafted appeal. All of our glazing cassettes can re re-glazed if required.